I’ll admit that I don’t often go to Italian restaurants for brunch (no particular reason), but after my first outing to Spina (review here) & the excellent food we had, I was willing to give it a try. I arrived with two friends late on a Sunday, in fact we were the only ones left in the restaurant. Needless to say, we had our pick of the tables. Being the daytime drinkers that we are, we couldn’t pass up the $10 bottle of Prosecco that was on offer. 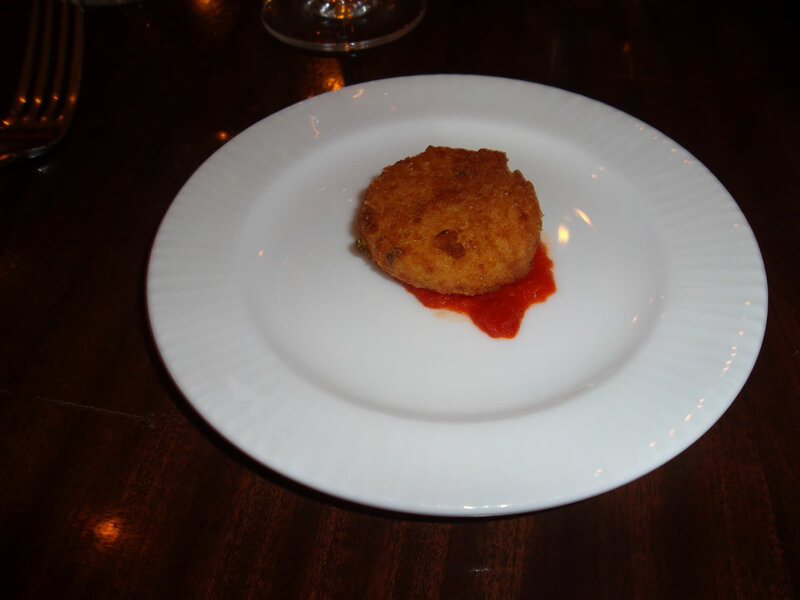 We were offered a small potato and cheese croquette while we waited & ordered the mussels which we shared. 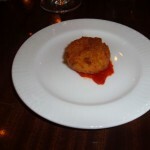 The croquette was very simple, served on top of a dollop of tomato sauce. The breading had an awesome crunch but only made us more hungry. Luckily the mussels arrived quickly. 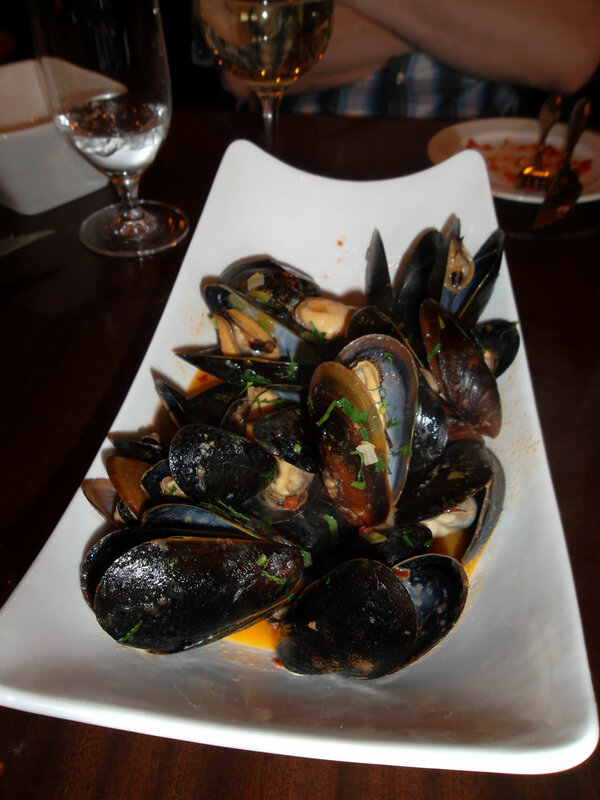 PEI mussels steamed in white wine with black pepper, cherry tomatoes and chive oil. My only gripe is that there wasn’t more sauce as I would have happily drank a pint of that stuff. It being brunch, all 3 of us opted for dishes with eggs. 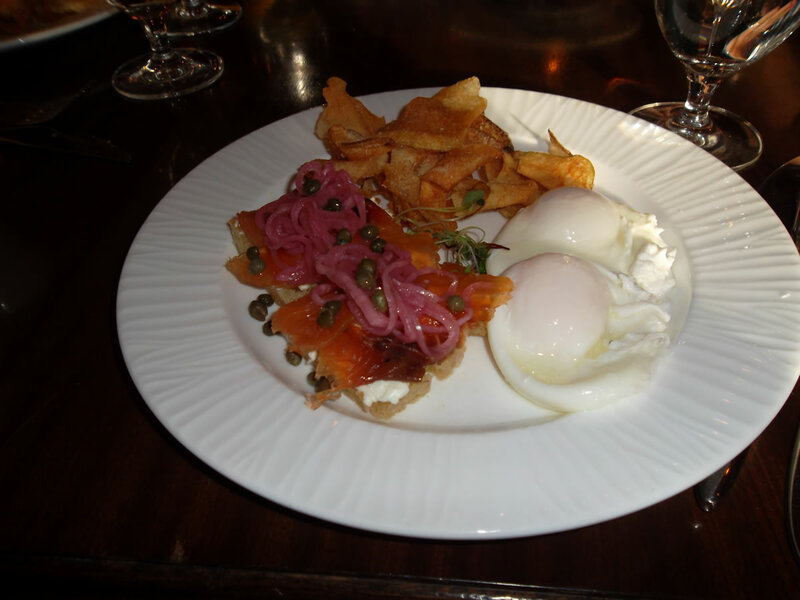 I got the cured salmon & eggs; house cured salmon, focaccia bread, mascarpone cheese, capers, red onions and two poached eggs. You really can’t go wrong here. I’ve tried to cure salmon at home & honestly I didn’t even come close to this. 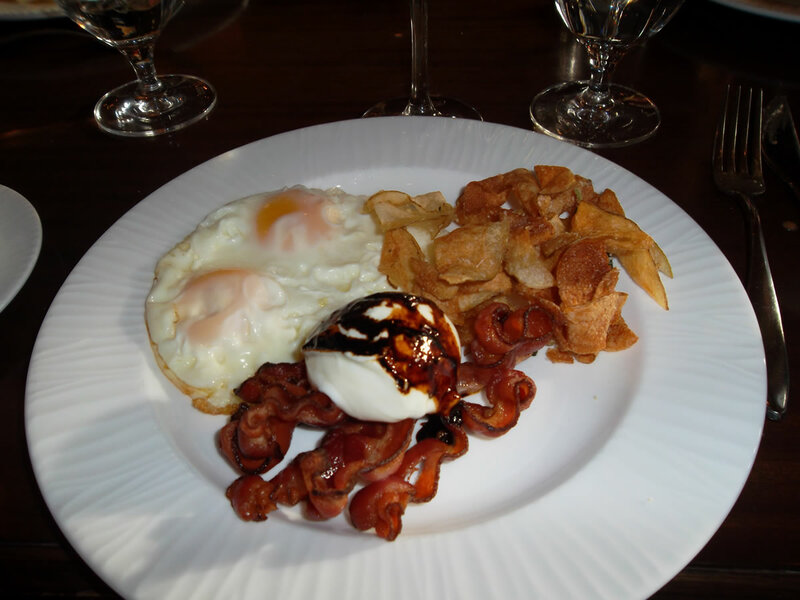 Rebecka opted for the “Eyes of the Bull”; sunny side up eggs, Applewood smoked bacon, mozzarella di bufala and fried potatoes. I immediately wished that my dish had some mozzarella. It looked that good. Dan got the steak & eggs; a 6 oz. 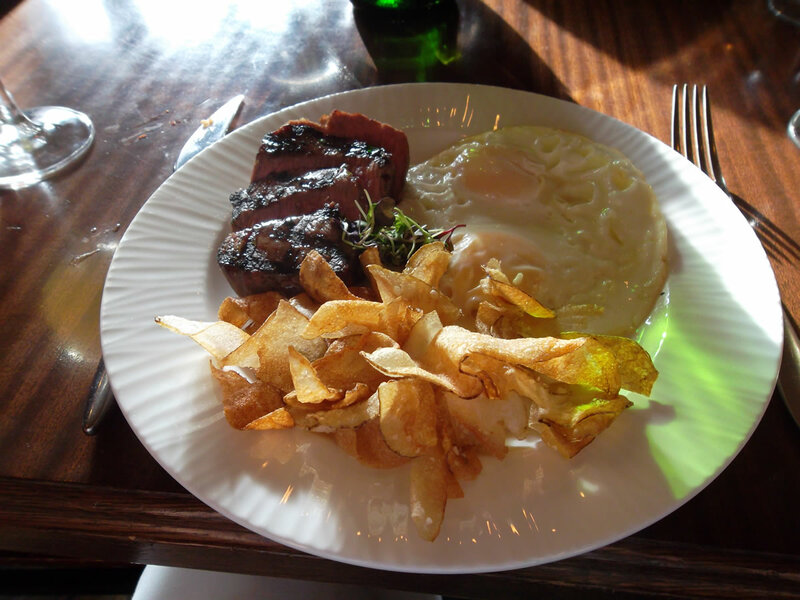 strip steak, your choice of eggs & chips. Again, I didn’t try this dish, but he seemed pleased with it. There are some pasta dishes on the brunch menu; Carbonara, Ravioli, Spaghetti & Gnocchetti. If I go back I’d like to try one of these, but I was happy with my choice. As we had arrived so late we pretty much ran past the brunch seating time but the staff let us finish our food & drinks in-between services. 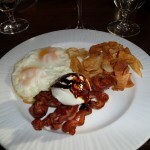 We all really enjoyed the brunch there & I have to rethink my aversion to Italian brunches. 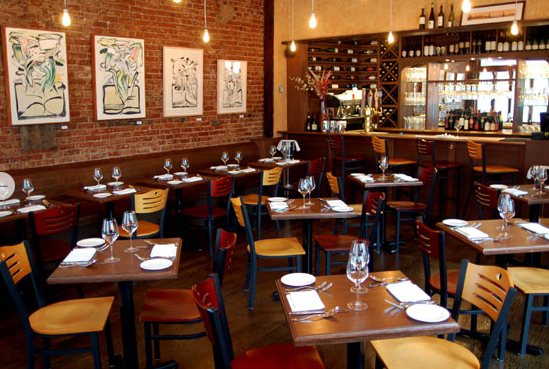 Spina Restaurant: 175 Avenue B at 11th Street.